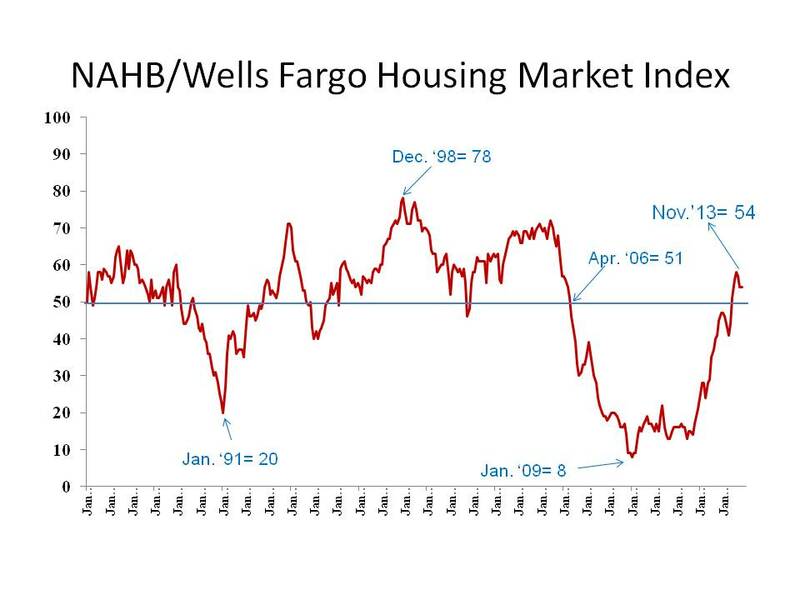 The NAHB/Wells Fargo Housing Market Index for June rose four points to 49, just shy of the 50 mark indicating at least as much optimism as pessimism among single-family home builders. The index dipped 10 points to 46 in February from a sustained above-50 mark for 8 months and remained near there for 4 months. Builders are beginning to see customer confidence return but buyers do remain hesitant until their jobs are more secure and their home equity improves enough to make a down payment on a new home. The 4-month consecutive 200,000+ monthly increase in national job formations has and will continue to help consumes believe the economic recovery for the nation and for them individually will continue. Builders remain cautious because of the consumers’ caution and because construction crews are difficult to find and keep. Builders will add homes when they are most secure that the home can be completed on time and that a buyer will be ready and able to purchase. The June recovery was evident in all three components. The current sales index increased 6 points to 54, the expected sales for the next 6 months increase 3 points to 59 from a one point downwardly revised 56, and the traffic index increased 3 points to 36 from a 2-point upwardly revised May of 33. The three-month average regional indexes were mixed with the Northeast and South up one point to 34 and 49 respectively, the Midwest down one point to 46 and the West even at 47. 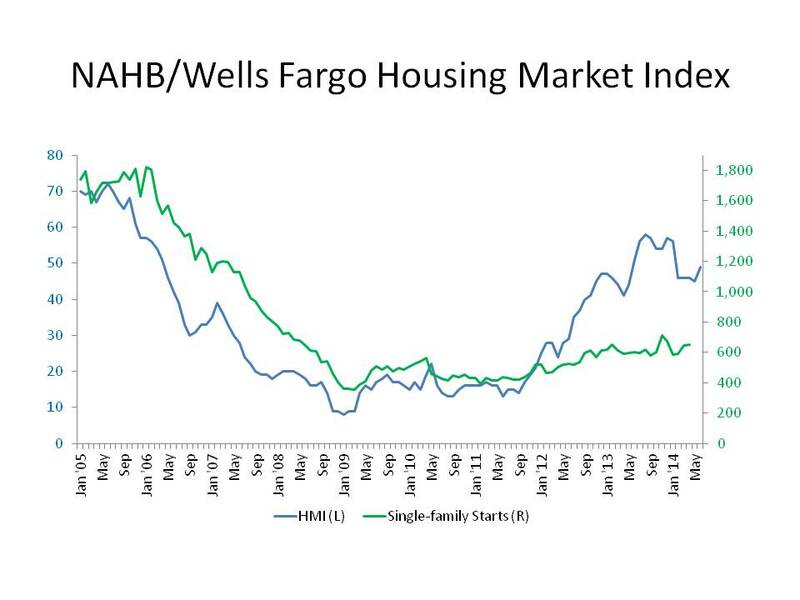 The April NAHB/Wells Fargo Housing Market Index rose one point from a one-point downwardly revised March to 47. This is the third consecutive month with the index below 50, the point where more builders see the market improving rather than getting poorer. Two of the three components of the index remained unchanged; the current sales index was at 51, the same as the one-point downwardly revised March index and the traffic index was 32, which is the same as the one-point downwardly revised February component. The heaviest weighted sub-index is the expectations for the next six months, which was up four points to 57. The essentially unchanged index is the result of builders waiting on expected spring demand while holding any further optimism until actual sales occur. Many of the individual comments mentioned stronger traffic or more serious buyers but the interest has yet turned into contract signings. Builders continue to meet some supply constraints as buildable lot supply either is not available or is priced beyond what the builder feels can be recaptured in a sale. Access to credit continues to be a concern across all parts of the country as builders search for credit to buy land and build homes and consumers apply for mortgages. A recent NAHB survey of builders found some improvement in builders’ access to capital and FDIC quarterly reports finally show some increase in bank holdings of AD&C residential credit. Lot supply will take longer to solve but access to credit is a critical first step. The housing recovery is likely to be hindered by these limitations just as demand begins to resurge. 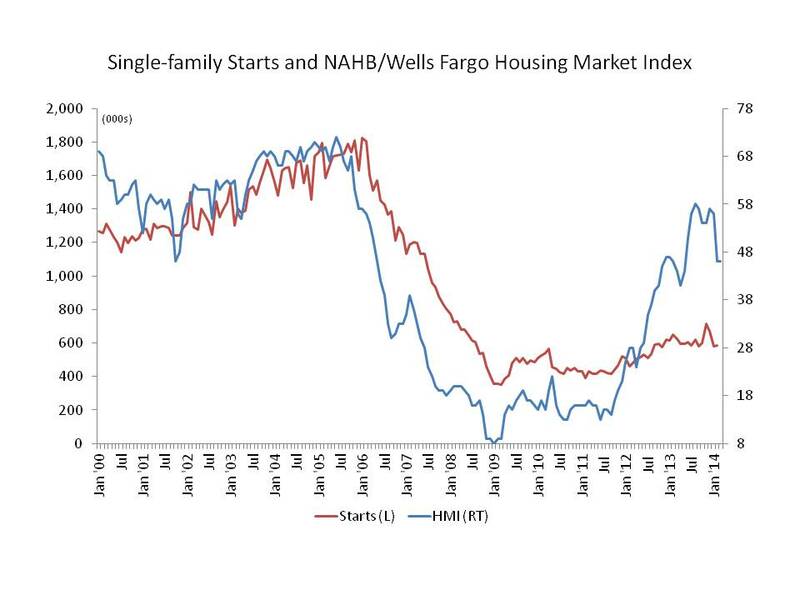 NAHB expects 1.1 million housing starts in 2014 primarily driven by the pent up demand of existing home owners. The first-time home buyer will return more gradually as mortgage credit standards become more rational and young adults’ incomes stabilize and grow. 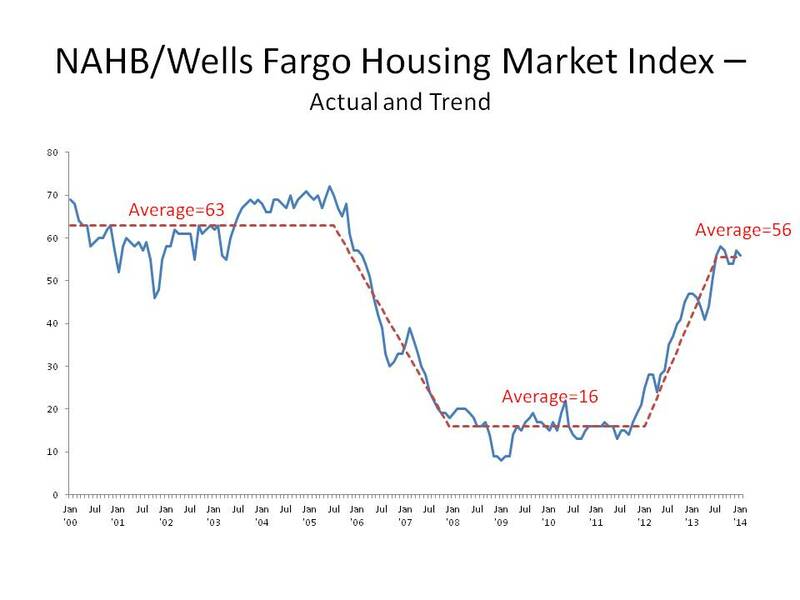 The March NAHB/Wells Fargo Housing Market Index held roughly the same at 47, which is up one point from the unrevised February level of 46. The past two months have the same message: unusually cold and wet weather over much of the US combined with increasing concern among builders that the supply chain cannot keep up with the expected spring rebound. Weather continued to limit builders and buyers ability to get to construction sites. At the same time, the continued limited supply of buildable lots and skilled labor has held back builders’ ability to resupply a very low inventory of new homes for sale. The January months’ supply of new homes dipped below 5 months and the absolute level remained at 184,000 compared to an average of 320,000 throughout 1990 and early 2000s. HMI components were mixed with current sales index up one point to 52 and traffic up two points to 33. Expectations for the next six months dropped one point to 53. Regional indexes reflected the degree of weather disruption with the three month moving average down four points in the South, three points in the Northeast and Midwest and two points in the West. Builders’ comments continued to concentrate on the unusual weather with greater frequency in the March report than the February report. The most mentioned supply chain problem continues to be lot availability followed by labor supply and cost. 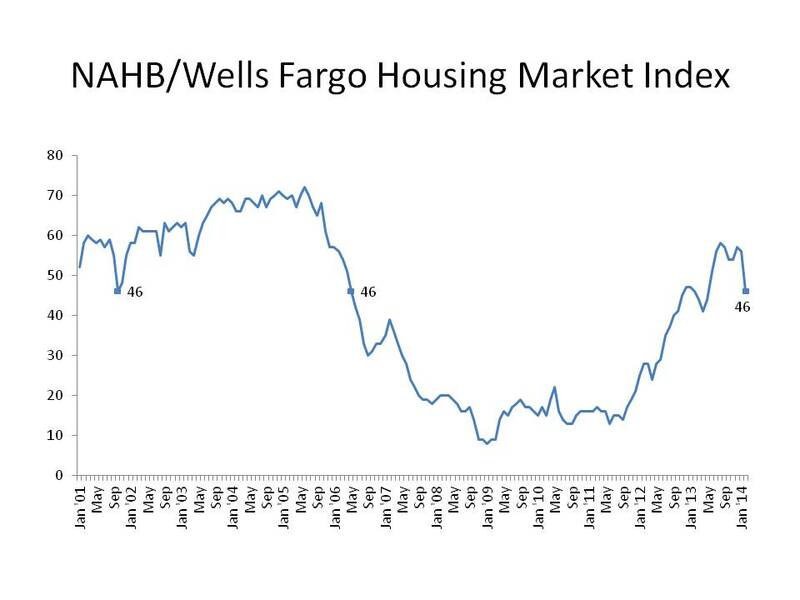 The February NAHB/ Wells Fargo Housing Market Index fell 10 points to 46 from the January level. The decline is the largest in the 30 year history of the index. The next largest monthly drop was October 2001 at 9 points. The February index is below the tipping point of 50 where more builders rate the market as good rather than poor for the first time since May 2013. The three components of the index fell significantly as well. The index for current sales fell 11 points, also the largest decline in that component in history. Expectations for future sales fell the least at 6 points and the traffic index fell 9 points, tying the previous worst decline in October 2001. The drop is a result of several forces falling at once. Unusual weather across much of the US reduced consumers’ shopping and buying. That impact can be seen in the differences in regional index changes. The three month moving average for the West where weather has been dry but not unusually cold or wet did not change. The Northeast where average temperatures have been significantly below average saw the greatest decline and the South suffering from unusually wet and cold also saw a larger decline. Weather effects also depressed retail and auto sales, which in turn depressed consumers’ desire to shop or purchase homes if their livelihood depended on those sectors. Finally, shortages of labor and lots have also begun to have a real effect on builders’ ability to build and sell homes. As shortages become more severe, builders are faced with the possibilities that they will not be able to build up their exceptionally low inventories in anticipation of the spring selling season. Shortages and cost increases for labor, lots and building materials have caused builders problems with appraisals as comparable existing home prices are not subject to the same forces. Consumers are reluctant to accept the higher prices and shift to an existing home purchase. As a result, those prices have risen by double digit rates. The feedback effect will eventually raise home prices to meet the cost of building but that may take some time. 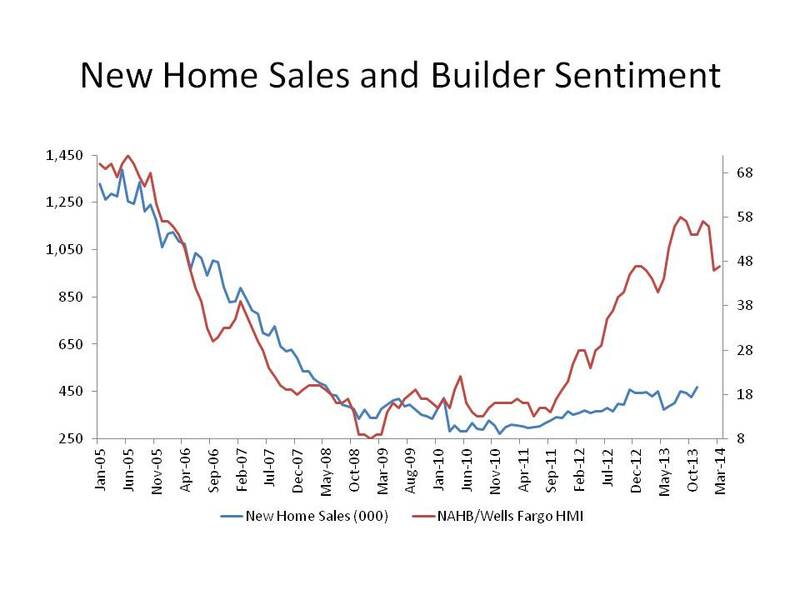 NAHB remains positive about construction and sales in 2014 as pent up demand and an improving economy will bring home buyers back into the market. The January NAHB/Wells Fargo Housing Market Index dropped one point from a one-point downwardly revised December level to 56. This is the eighth consecutive month above 50, the point where more builders rate the market good rather than poor. The December index, originally reported at 58, matched the recent high in August before the mortgage rate spike and the federal government shutdown softened buyer and builder confidence. The January level demonstrates builders’ general positive attitude toward the current and future market but with some continued attention to the headwinds affecting the industry. Builders continue their frustration over low appraisals that do not reflect the added value of more energy efficient equipment, higher costs for land, labor and building materials and the differential between high maintenance existing homes and low maintenance new homes. Low appraisals kill sales since very few buyer are able to make higher down payments to cover the equity required by lenders using inaccurate appraisals. The three components of the index fell as well: the current sales index fell one point to 62, the expected sales index fell two points to 60 and the traffic index fell three points to 40. By region, the three-month moving average in the Northeast and West increased four points, fell one point in the Midwest and remained level in the South. The severe cold and icy weather in the South in December may have led to a seven point drop in the month-to-month trend. In separate comments, builders did foresee a promising spring buying season as more of their customers have demonstrated greater commitment recently and the builders expect more lookers to become buyers. 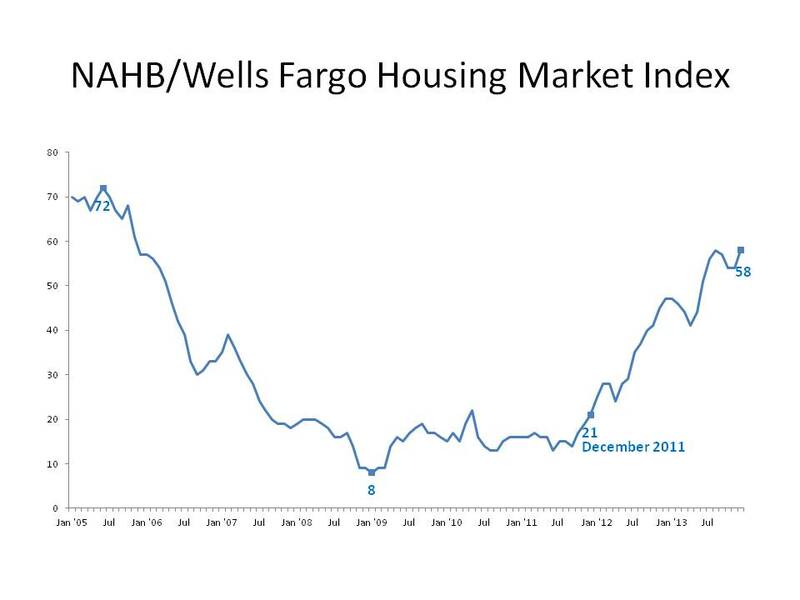 The November NAHB/Wells Fargo Housing Market Index held steady at 54 from a one-point downwardly revised October level. The index has remained above 50 for six consecutive months, the first time since early 2006. Of the three components, current sales remained unchanged at 58, expectations for future sales declined one point from a one-point downwardly revised figure and rests now at 60 and above 50 for the 10th consecutive month. The traffic component was at 42, down one point from a one-point downwardly revised 43. The index leveled off in September and dropped one point as interest rates finally took their toll on builder and consumer confidence. The residual of the October government shut down and game of chicken in Washington took a more dramatic toll on builder confidence as the HMI fell three points from September to October. The survey is taken in the first 10 business days of the month so the October shut down was in effect as most of the responses were collected. The one-point downward revision to October reflects the continued concern from late submissions even as the government crisis was postponed. November brings a continued concern over the functioning of the federal government as well as uncertainty about mortgage rates and a relatively slow economic recovery. Builders remain modestly optimistic as the index remains above 50 (more builders rate the market good as opposed to poor) but express their continuing concerns about rising costs of land, labor and building materials. The underlying improvement in employment remains the primary factor that will lead to continued growth in the housing market and NAHB expects that to continue.